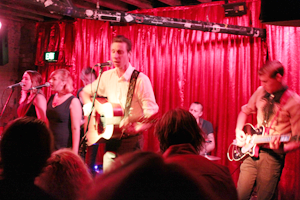 In February 2015, HEARsmart launched a pilot study that will help determine how live music venues in Australia can become more ‘hearing friendly’. We are working with a small number of live music venues in Melbourne (to date three venues are on board, Cherry Bar (pictured right), Yah Yahs and Shadow Electric to develop practical and cost-effective solutions to help reduce noise exposure for musicians, patrons and venue staff while maintaining or even improving the fidelity of the music being played. As much of this work is in progress, the final ‘package’ is as yet unknown, but could involve anything from free availability of hearing protection and poster campaigns to encourage use, to venue modifications to reduce reverberation, provision of quieter spaces so patrons can take a break, or working with sound engineers to produce music at safer levels, while remaining enjoyable to patrons. The HEARsmart pilot project has the support of Music Victoria (MV) and we hope to work with MV and other musician member-based organisations throughout Australia to encourage uptake of the HEARsmart noise-reduction package. In an ideal world, we imagine that HEARsmart would one day provide some form of industry accreditation for venues that meet key criteria in managing their sound levels. We spotted a similar initiative in the UK recently, called EarSmart – this is clearly an issue that’s facing music venues the world over! Want more information? see our news item on this.